Manpuku Ramen is the latest addition to Chatswood's growing list of Japanese eateries. Last week I paid a visit to the newly opened Manpuku, which means 'full of blessings,' to satisfy my curiosity. Ramen Master in full concentration. It was a cold night and a bowl of hearty ramen sounded wonderful. Upon arrival, we were greeted by an energetic "irasshaimase" - which means welcome in Japanese. I was impressed by how busy Manpuku Ramen was on a Thursday evening. There was even a bit of wait for a vacant table. The menu was self-explanatory and it has been intentionally kept simple to remain true to its Japanese origins. It was not long before our orders started making their way to our table. The self-service counter was available for water and condiments such as chilli oil, garlic purée and Japanese pickled ginger. The Manpuku gyoza ($5.90/5p) was the first to appear on our table.These special pork and cabbage dumplings were thinly pan-fried on the bottom and topped with Spanish onion slices, shallots and chilli sauce. It looked simply amazing.These home-made gyoza dumplings were the perfect accompaniment to a bowl of steamy ramen. Soon, our ramen appeared with a flourish in Manpuku's special ramen bowl. Apparently this large-ish ceramic bowl retains the heat and sustains the temperature of the soup until you're finished your ramen - what a novel utility! 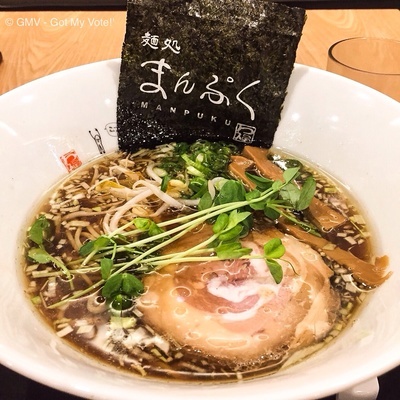 I started off with their signature gara shoyu ramen ($11.90). This traditional soy based chicken ramen has more than 300 years of history in Japan. It contained butter soft pork belly, bean sprouts, bamboo shoots, shallots and a seaweed sheet. It was delicious and heart-warming on a chilly night. Kono deaini ramen - only available at Manpuku. My friend ordered a kono deaini ramen ($13.50) which is Manpuku's specialty ramen and it is not available anywhere else in Australia.This ramen comprised a soy based pork soup that was loaded with springy ramen noodles, tender moist pork belly, bean sprouts, bamboo shoots, shallots, seaweed and egg.The staff recommended adding garlic purée and pickled ginger to further enhance the flavour of this dish - the result was a rich, flavoursome and extremely filling bowl of ramen. The Japanese braised egg 'ni tamago' deserves a special mention too. It was simmered in the highest grade Japanese soy sauce and the gooey yolk served as a tasty topping for any delicious ramen. We also ordered a cha shu rice. The small rice bowl was a steal at the bargain price of $2.90. It contained tender soft pulled pork belly, covered in bean sprouts, shallots, sesame, mayonnaise and teriyaki sauce. It was a luxurious, hearty rice bowl and the pulled pork pieces were tender and tasty. The dish was moreish and addictive - I highly recommended it. Overall, Manpuku Ramen is a good casual place to visit when you are looking for a low-key dinner or a lazy weekend meal. All dishes are affordable and come with great depth of flavour. Where:226 Victoria Ave, Chatswood, 2067. When:Open Tuesday - Sunday for lunch from 11.30 - 2.30 and for dinner from 5pm - 9pm. Closed Monday. Good for kids:Yes, meals are large though, so it may be best to share.